It is time for the very first historical episode of the new series and it is also the first episode written by Mark Gatiss who is a frequent writer of the Steven Moffat era of the show. It takes the Doctor and Rose to 19th century Cardiff and run into none other than Charles Dickens himself. Naturally because it is a Doctor Who episode, everything is not well as a zombie-like creature interrupts a performance by Dickens. Rose gets kidnapped etc. etc. etc. The First thing I need to mention is the fantastic production values. While the first two episodes definitely did not look very bad, the generic lighting in modern day UK is not very impressive in ‘Rose’ and the dull looking alien creatures in ‘The End of the World’ did not improve the believability of the story at all. 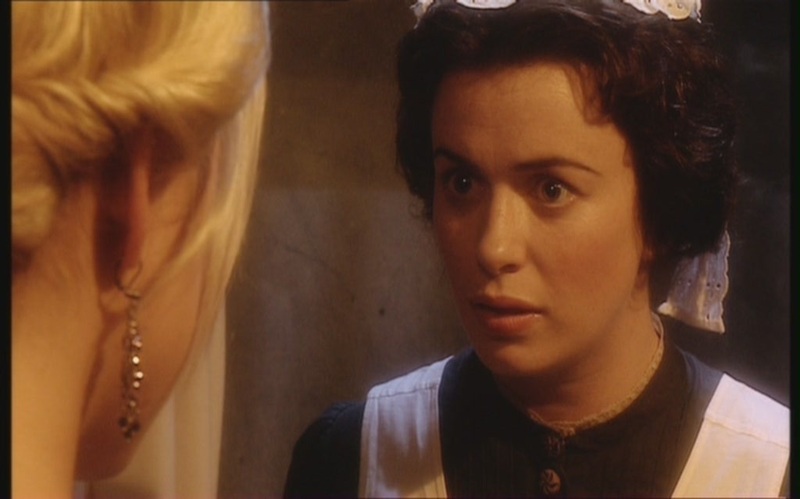 In ‘The Unquiet Dead’ though, there is nothing in the episode that will make you doubt it is 1869. Right down from the clothes everyone is wearing, the scenery, the lighting, everything comes together seamlessly and it is definitely one of the best looking episodes of the first series. Even the monsters of the episode look like they came right out of a horror movie thanks to the inventive use of visual effects. I cannot even begin to imagine how it must have felt like to be a fan of the classic series and then witness the show’s return and watch this episode and try to wrap your head around the fact that ‘Doctor Who’ finally has a budget. What also helps is the fantastic atmosphere throughout the episode that is being elevated by the great performances and the beautifully written dialogue. 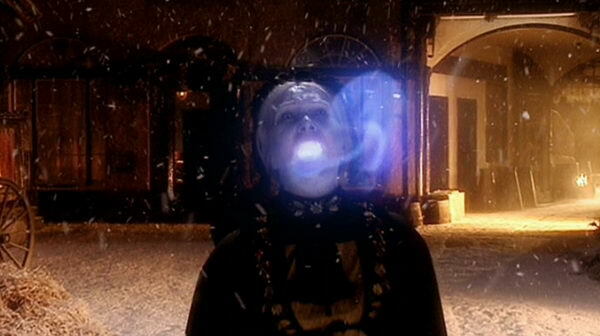 What ‘The Unquiet Dead’ does really well when it starts is bring up just how magical this premise can be. Rose talks about how for everyone else, a day happens once and then it is gone forever – but for the Doctor nothing is truly gone forever as he can go back and visit Christmas in 1860 (although it turns out to be 1869) by just pressing a few buttons. It adds a sense of wonder and charm to the show, which is important to establish this early on. Rose in this episode is improved a lot which is not a coincidence as it is the first episode of the new series not to be written by Russell T Davies but a problem is then risen because some of her actions here are definitely something you would not expect the girl who ran off on her boyfriend Mickey for a strange man in a box to do. Yes the character in ‘The Unquiet Dead’ is a lot better and more likable but it is still very inconsistent with how her bratty personality got introduced in ‘Rose’. I probably should explain a little more what makes her a better character here; basically in one scene she acts very nicely towards a servant girl she has never met. It is a lovely scene and definitely the best Rose moment of the series so far but it still contradicts what we have gotten to know about how she acts around others. Simon Callow as Charles Dickens is just perfect, he has such a likable presence that you just cannot take your eyes off of him whenever he is on screen. Of course Christopher Eccleston continues to impress with some excellent comedic timing. The scene were Charles and the Doctor are chasing after Rose’s kidnappers is one of the highlights of the episode. I love how the Doctor almost forgets about Rose once he finds out it is actually Charles Dickens next to him and starts acting like a true fanboy. I also really like how Charles Dickens is not the main focus of the episode as many historical figures are in these episodes, instead he just happens to get involved and in many ways is not portrayed like a perfect person – instead just a normal person who does not believe in the supernatural stuff so easily. Billie Piper gives another good performance as Rose who as I just mentioned; is a lot more likable here. As a Gatiss episode, in my humble opinion this is still his strongest output. While I do not dislike many of his other stories, he just has not been on his A-game since ‘The Unquiet Dead’ compared to how excellent his episodes for ‘Sherlock’ are. Although while ‘The Unquiet Dead’ is his best ‘Doctor Who’ episode, his best ‘Doctor Who’ related story (and the best script he has ever written in general) is most definitely ‘An Adventure in Space and time’. But this is not a retrospective on Mark Gatiss’ work so lets get back to the episode. A weak point in the episode is the character Gwyneth. While the actress (Eve Myles) portraying her does a great job – her character is by far the least developed in the episode while everyone else are very interesting and three dimensional. Another is that the second half does not live up to the first as it kind of loses a bit of its novelty when the plot gets closer to the end and is just not as interesting as when the characters just interacted with each other. In conclusion, this is one of the strongest episodes of the first series and is Gatiss' strongest episode overall. The pacing is suitably slow, the lighting is fantastic, the production values are excellent and the script is filled with excellent lines of dialogue and the story overall is very engaging. It is just a great episode.